In the underpass that runs beneath the dual carriageway near to Tullie House museum and Carlisle Castle, a large 14 tonne polished granite stone, inscribed with a 1069 word curse has been placed. The curse was first uttered by the Archbishop of Glasgow, Gavin Dunbar, in 1525, and was aimed at the various families that made up the infamous Border Reivers, who ravaged and terrorised the English and the Scottish sides of the borders. Archbishop Dunbar wrote the curse, now known as the The Monition of Cursing, in order that it should be read out in all the churches on the Scottish side of the border, as a warning to the Reiving families. It cursed them to the fires of Hell if they didn't return to the church and cease their thieving ways. Dunbar's curse wasn't the first to be issued against the Reiving families.....in 1498, the Bishop of Durham, Richard Fox denounced the Reivers of Tynedale in Northumberland and forbade any ministers from admitting them to church. Carlisle's Cursing Stone was installed in 2000 as part of the Millennium celebrations, but drew almost instant criticism from a Christian minority who took the stone and the curse as a slur against Christianity. They demanded that not only should the stone be removed, but that it should be destroyed. Luckily common sense won the day and the stone survives. Johnstone, Johnston, Bromfield, Harden, Brisco, Tailor, Batey, Jameson, Jamieson, Irving, Gilchrist, Croser, Young, Milburn. Hedley, Jardine, Stokoe, Turner, Little, Thomson, Rutherford, Crichton, Eliot, Noble, Davison, Douglas, Hetherington, Charlton, Anderson, Simpson, Bell, Chamberlain, Irvine, Hodgson. Each one of these family names represents the human side of the violence that was meted out to the Border areas for around 400 years. Each of these family names was hated and loathed by Archbishop Dunbar when he uttered his curse. There are other names of course, but the ones that are listed here are some of the more well known families. They wrought havoc on both sides of the border, against English and Scottish victims, and poured scorn and ridicule on the rule of the Wardens of the Marches. 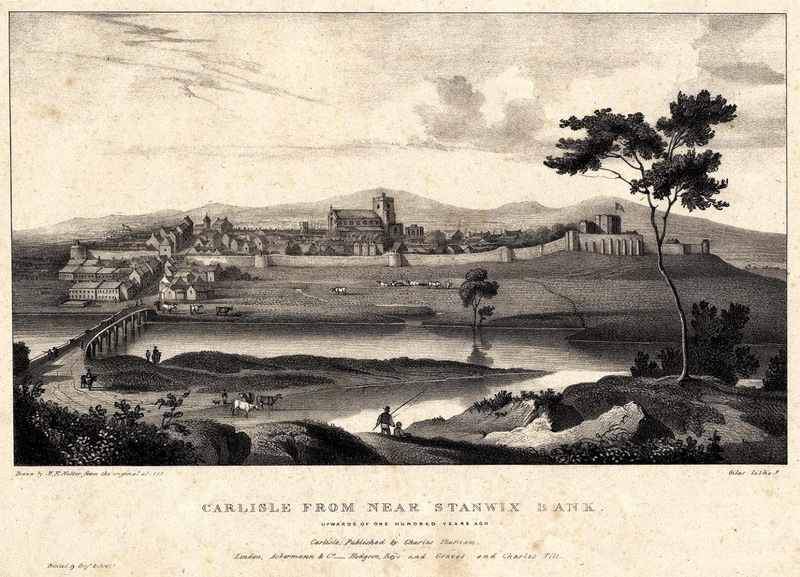 Carlisle Castle was the headquarters of the Western Marches, and was used on a number of occasions to imprison captured Reivers, so the link between the Curse stone and the castle of Carlisle and the Reivers is a long a violent one. "I curse their head and all the hairs of their head; I curse their face, their brain (innermost thoughts), their mouth, their nose, their tongue, their teeth, their forehead, their shoulders, their breast, their heart, their stomach, their back, their womb, their arms, their leggs, their hands, their feet, and every part of their body, from the top of their head to the soles of their feet, before and behind, within and without." "May all the malevolent wishes and curses ever known, since the beginning of the world, to this hour, light on them. May the malediction of God, that fell upon Lucifer and all his fellows, that cast them from the high Heaven to the deep hell, light upon them." "May the fire and the sword that stopped Adam from the gates of Paradise, stop them from the glory of Heaven, until they forebear, and make amends." "May the evil that fell upon cursed Cain, when he slew his brother Abel, needlessly, fall on them for the needless slaughter that they commit daily." "May the malediction that fell upon all the world, man and beast, and all that ever took life, when all were drowned by the flood of Noah, except Noah and his ark, fall upon them and drown them, man and beast, and make this realm free of them, for their wicked sins." "May the thunder and lightning which rained down upon Sodom and Gomorra and all the lands surrounding them, and burned them for their vile sins, rain down upon them and burn them for their open sins. May the evil and confusion that fell on the Gigantis for their opression and pride in building the Tower of Babylon, confound them and all their works, for their open callous disregard and opression." "May all the plagues that fell upon Pharoah and his people of Egypt, their lands, crops and cattle, fall upon them, their equipment, their places, their lands, their crops and livestock." "May the waters of the Tweed and other waters which they use, drown them, as the Red Sea drowned King Pharoah and the people of Egypt, preserving God's people of Israel." "May the earth open, split and cleave, and swallow them straight to hell, as it swallowed cursed Dathan and Abiron, who disobeyed Moses and the command of God." "May the wild fire that reduced Thore and his followers to two-hundred-fifty in number, and others from 14,000 to 7,000 at anys, usurping against Moses and Aaron, servants of God, suddenly burn and consume them daily, for opposing the commands of God and Holy Church." "May the malediction that suddenly fell upon fair Absolom, riding through the wood against his father, King David, when the branches of a tree knocked him from his horse and hanged him by the hair, fall upon these untrue Scotsmen and hang them the same way, that all the world may see." "May the malediction that fell upon Nebuchadnezzar's lieutenant, Olifernus, making war and savagery upon true christian men; the malediction that fell upon Judas, Pilate, Herod, and the Jews that crucified Our Lord; and all the plagues and troubles that fell on the city of Jerusalem therefore, and upon Simon Magus for his treachery, bloody Nero, Ditius Magcensius, Olibrius, Julianus Apostita and the rest of the cruel tyrants who slew and murdered Christ's holy servants, fall upon them for their cruel tyranny and murder of Christian people." "And may all the vengeance that ever was taken since the world began, for open sins, and all the plagues and pestilence that ever fell on man or beast, fall on them for their openly evil ways, senseless slaughter and shedding of innocent blood." "I sever and part them from the church of God, and deliver them immediately to the devil of hell, as the Apostle Paul delivered Corinth. I bar the entrance of all places they come to, for divine service and ministration of the sacraments of holy church, except the sacrament of infant baptism, only; and I forbid all churchmen to hear their confession or to absolve them of their sins, until they are first humbled / subjugated by this curse." "I forbid all christian men or women to have any company with them, eating, drinking, speaking, praying, lying, going, standing, or in any other deed-doing, under the pain of deadly sin." "I discharge all bonds, acts, contracts, oaths, made to them by any persons, out of loyalty, kindness, or personal duty, so long as they sustain this cursing, by which no man will be bound to them, and this will be binding on all men." "I take from them, and cast down all the good deeds that ever they did, or shall do, until they rise from this cursing." "I declare them excluded from all matins, masses, evening prayers, funerals or other prayers, on book or bead (rosary); of all pigrimages and alms deeds done, or to be done in holy church or be christian people, while this curse is in effect." "And, finally, I condemn them perpetually to the deep pit of hell, there to remain with Lucifer and all his fellows, and their bodies to the gallows of Burrow moor, first to be hanged, then ripped and torn by dogs, swine, and other wild beasts, abominable to all the world. And their candle (light of their life) goes from your sight, as may their souls go from the face of God, and their good reputation from the world, until they forebear their open sins, aforesaid, and rise from this terrible cursing and make satisfaction and penance." 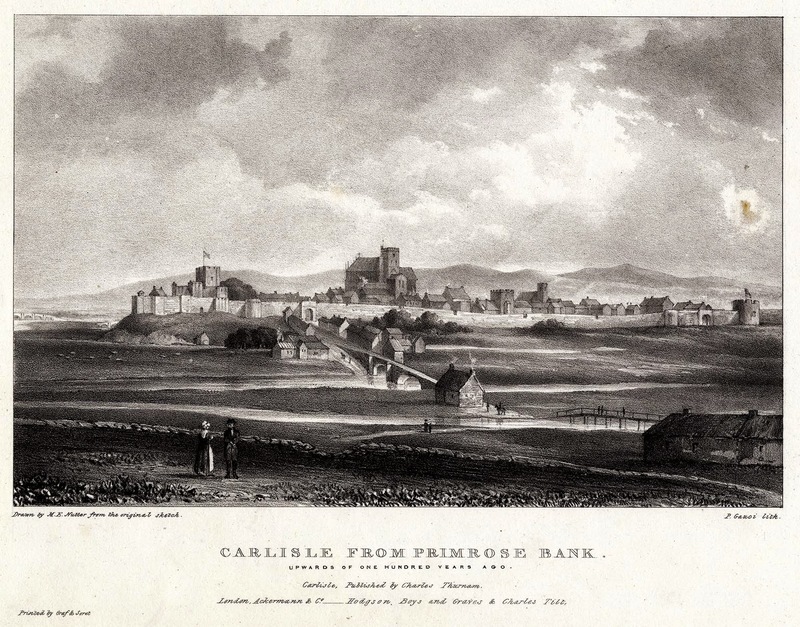 Records dating from 1534, state that the Franciscan Friary of Carlisle was being used to store munitions and military ordnance. Indeed, there was a friary here from at least the 1330s, as other historical records show that Edward Balliol, claimant and short lived holder of the Scottish throne (1332 to 1336) lodged here on a number of occasions. Above. Modern day Fisher Street, the site of the Franciscan Friary of Carlisle. C.J.Brooke, in his book "Safe Sanctuaries" includes the Friary in his list of ecclesiastical buildings with indications of defence built in....however, it's more likely, given the importance of the items being stored there in the 1530s, and the importance of the frequent lodger, Edward Balliol in the 1330s, that the friary was a building with elements of 'security' rather than 'defence', a subtle difference demonstrated in a number of buildings on this blog....Castle Dairy in Kendal and Helsfell Hall to quote two examples. It's a shame that I've not been able to find any images of this building, but if any turns up, I'll update this post. It was widely thought that the Bochard and the English gates were one and the same....one simply replacing the other....however research has now shown that the two were completely separate entities. Both gates were synonymous with the Citadel; the Bochard Gate was the original portal into the city, providing access at the Southern end of the walls, the English Gate, never really a gate in the true sense of the word, was probably more of a sally port, and is strongly associated with the building of the Citadel. Above. Modern view of the site of the Bochard Gate. The view above, looking between the West and East towers of the Citadel, represents the site of the Bochard Gate, mentioned in Pipe Rolls dating from 1210. 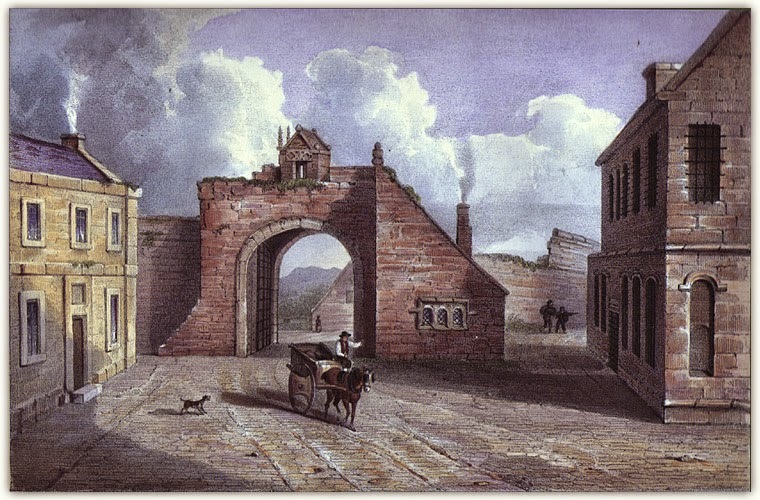 Before the Citadel was built in 1542, the Bochard Gate was the only entrance into the city of Carlisle from the South. 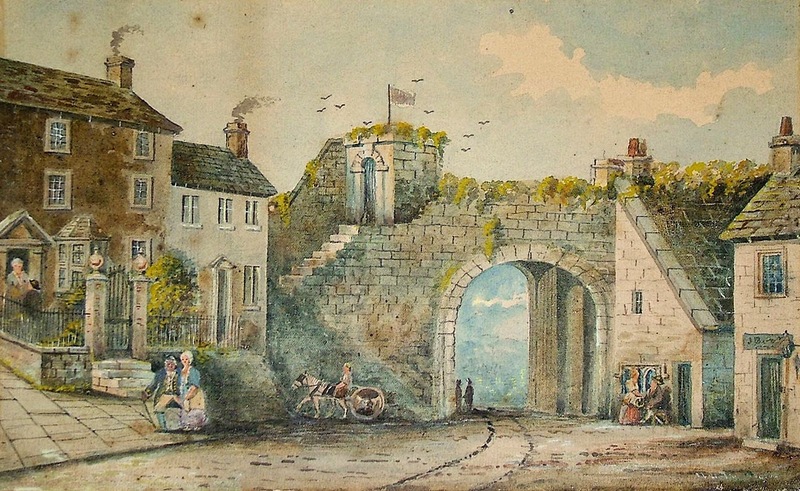 The Bochard Gate was almost completely gone by 1805. 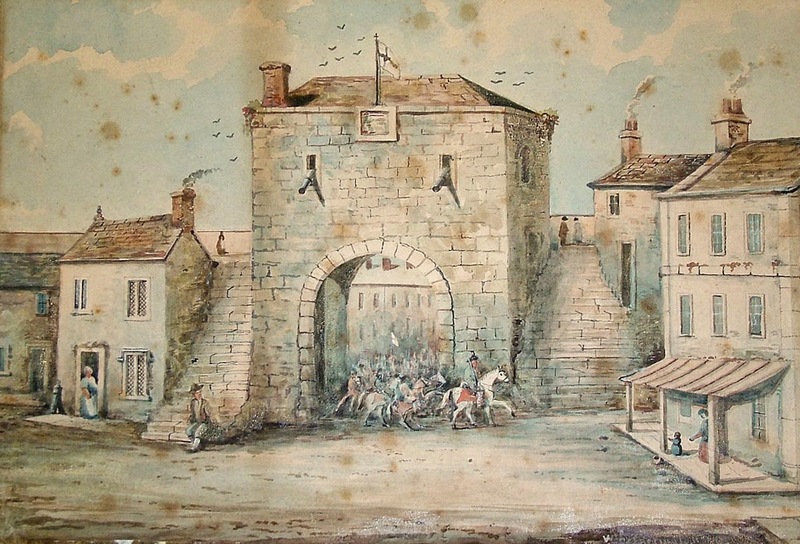 A pencil drawing of this period shows at least one wall of the gate still standing. However all traces were removed in 1808, when the new Court Houses were erected, incorporating one tower of the original Citadel. The stone from the demolished tower and the gate, was used to fill in the ditch that existed outside the city walls. Any deep excavations in this area for the road that now runs between the two towers, regularly turns up large chunks of masonry. Above. Etching showing the Bochard gate sandwiched between the artillery towers of the Citadel. The etching shown above, shows the remains of the Bochard Gate sandwiched between the two towers of the Citadel, bricked up and no longer in use as an access point. At this point in time, the English Gate would have been in existence, enabling access to the city in the South Eastern corner of the walls. Above. 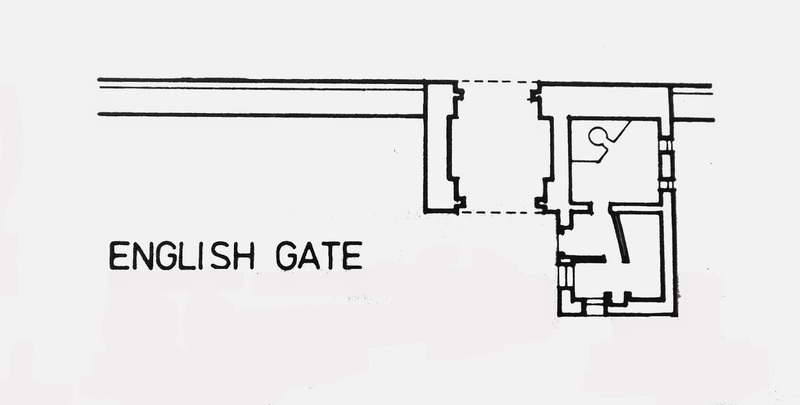 The only image I could find of the English Gate. Judging by the image above, the English Gate had neither a tower or a wall walk over it...it was simply a gateway through the walls, albeit heavily defended within the proximity of the Citadel. 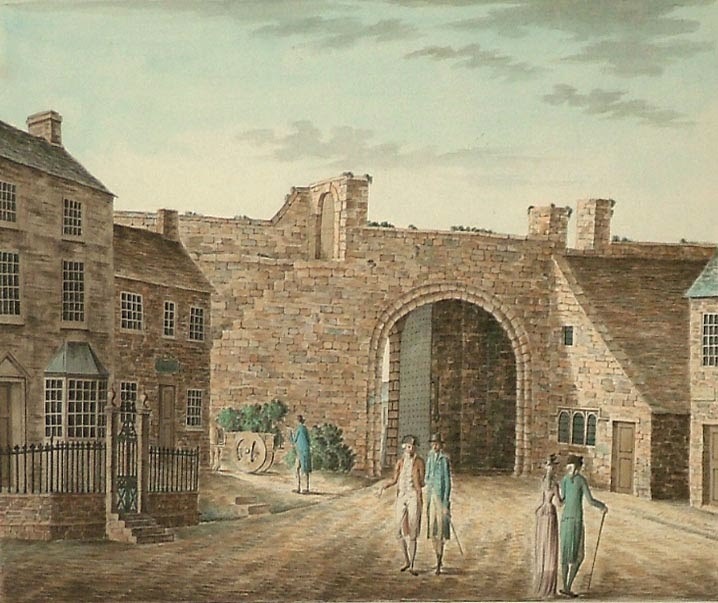 The English Gate was demolished 1811, with the buried foundations removed in 1817. Above. 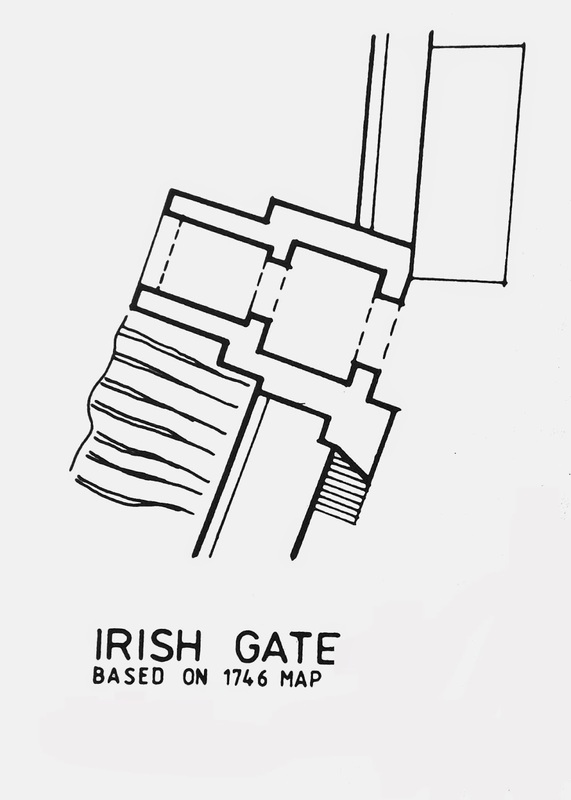 Plan view of the English Gate. The English Gate appears to have a small vestigial barbican, strangely built within the walls, more likely providing support for hefty gates. 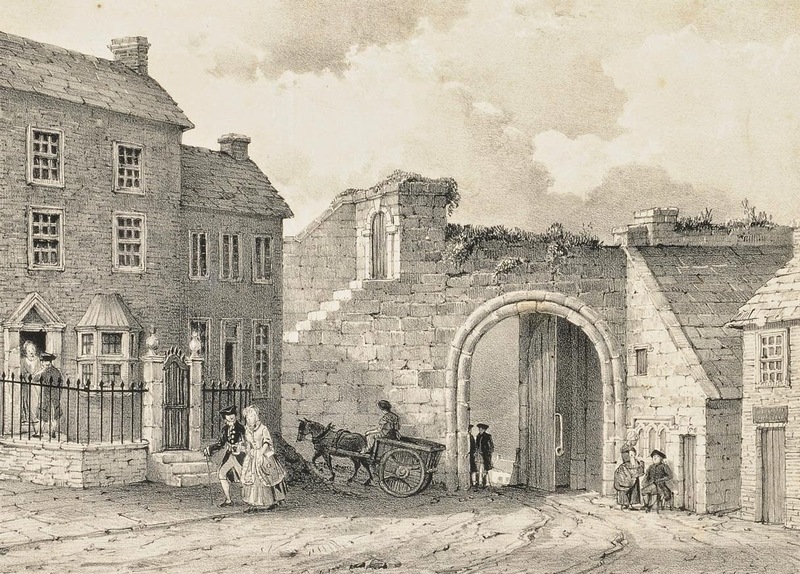 The Scotch Gate, otherwise known as the Rickergate (Richard Gate) stood at the East side of Carlisle, somewhere around the modern day junction of Scotch Street and Rickergate. 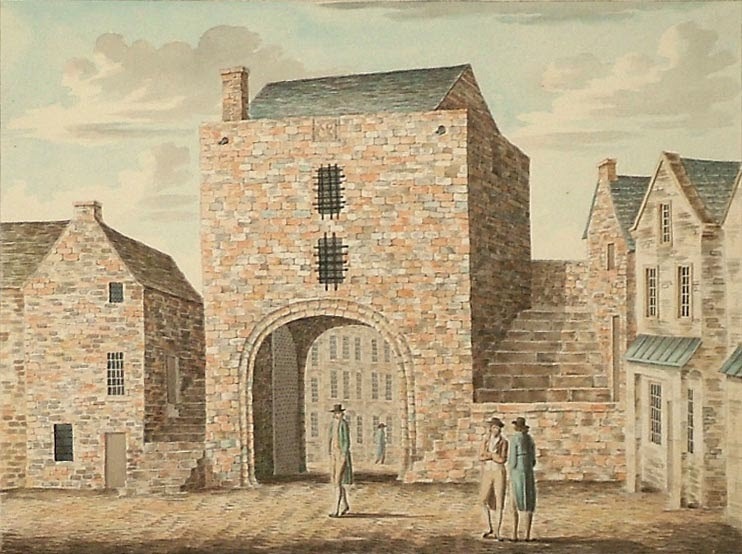 From contemporary etchings and paintings, the tower looks to have been a three story structure, with the gateway shut off by two huge wooden doors, and a first floor and second floor above possibly used as a debtors prison in its later life. Above. The junction of Scotch Street and Rickergate (or Richard Gate) the site of the Scotch Gate. Unfortunately for us, the only pictorial representations of the gate all appear to have been rendered from within the city walls. I've not been able to find any images showing how it would have looked from outside the city walls. Above. 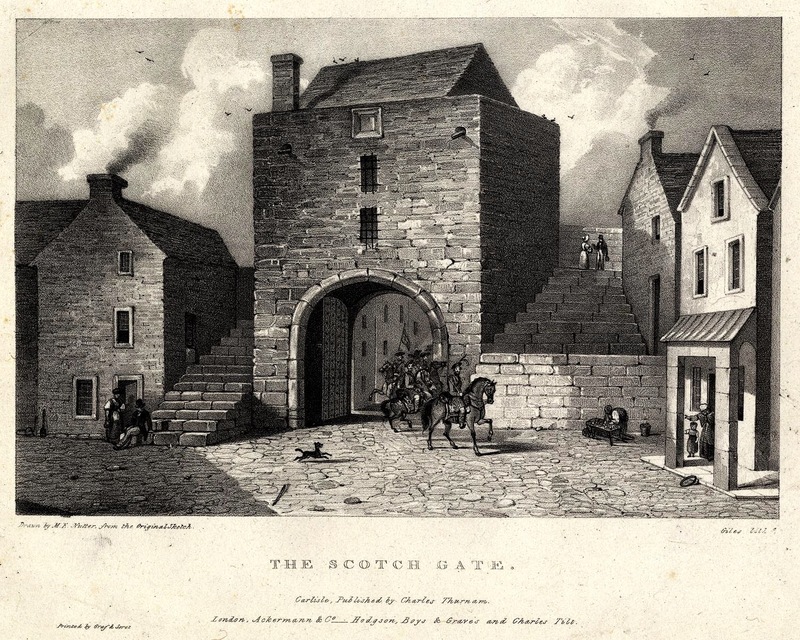 Pictorial representation of the Scotch Gate on a cigarette card. Above. 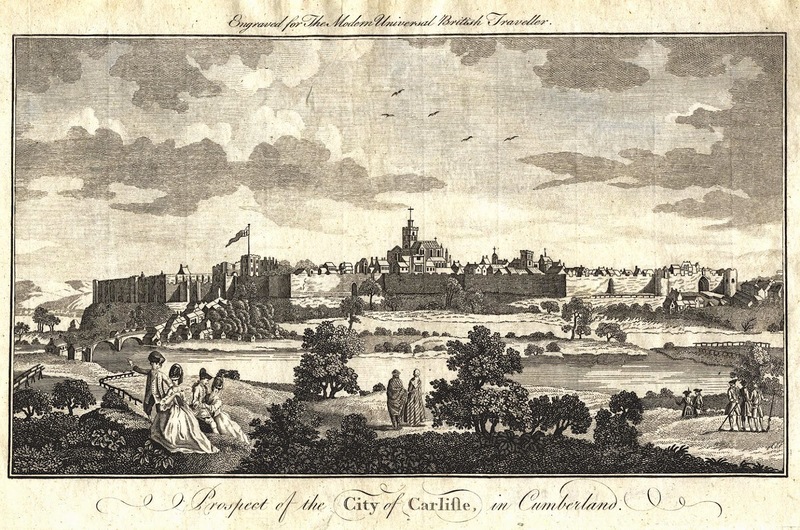 Panoramic view of Carlisle from the East. The Scotch gate is just above the bridge. Above. 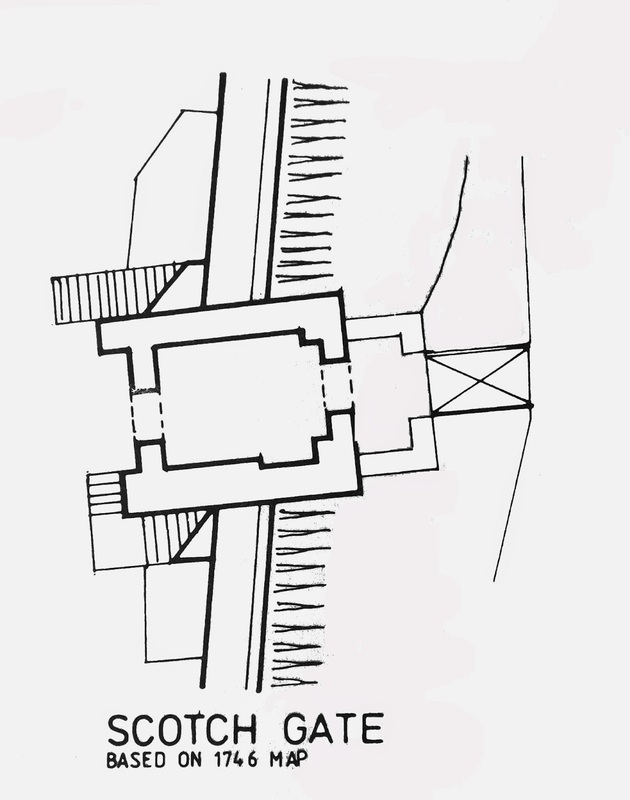 Plan view of the Scotch Gate in context of the city walls. 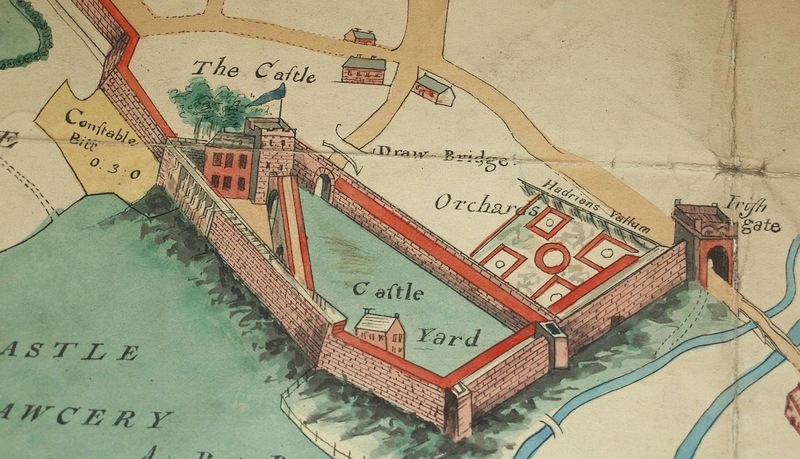 The Scotch Gate is mentioned in a record of the fortifications belonging to Carlisle, dated 1539, along with the other gates, the Bocher Gate and the Caldew Gate (the Irish Gate). A survey of 1563 stated that the gate was mostly made of wood and was in an extremely poor state of repair. This report may have prompted the rebuilding of the gate in stone. 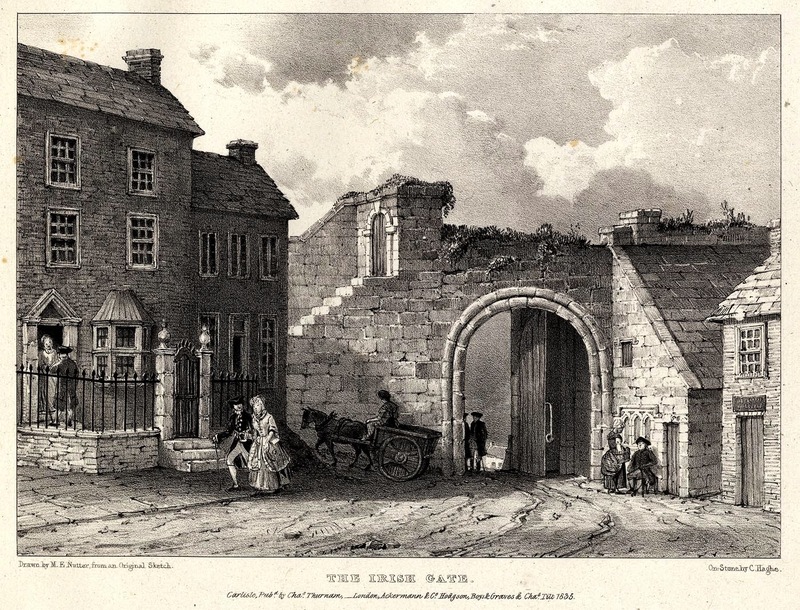 The gate was fully demolished in February 1815, with the stone being used to build a causeway between two bridges that spanned the River Eden. 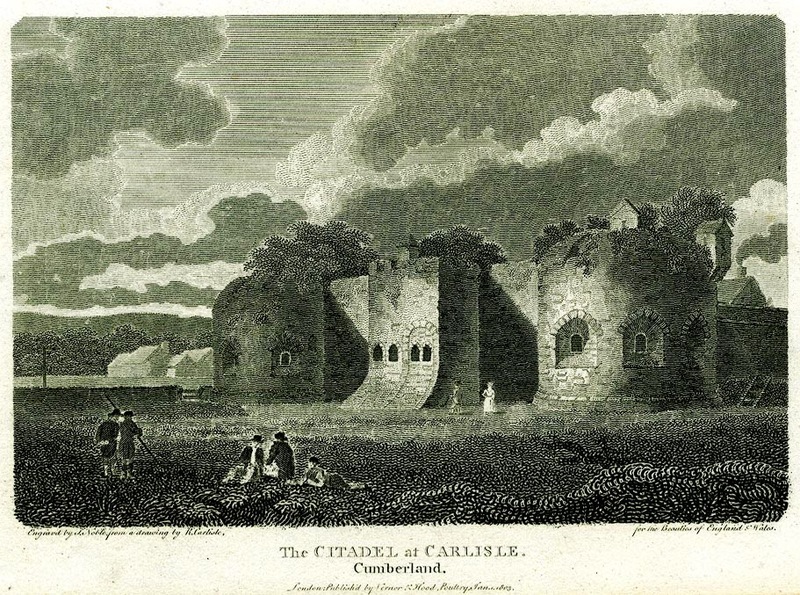 On the second floor of the keep at Carlisle, are some tantalising remnants of Carlisle's long history and its interactions with both the kingdoms of England and Scotland. The room contains a pair of tiny ante-rooms, now locked safely behind a glass door. To the left of the room, the heavy oak door can still be seen, now mounted on the wall. To its right, the entrance to King David I's oratory can just been seen disappearing to the right. In this room, on 24th of May, 1153, King David died, At his death, his obituary described him as "David, son of Mael Coluim, King of Scotland and England." Above. The door to King David's oratory, now hung on the wall. Above. The entrance to King David's oratory, now protected behind a glass door. As well as these two tiny room's historical connections with Scottish Royalty, the walls also contain some fantastical carvings, dating from the Wars of the Roses (1455 to 1487). Some of them were carried out in almost expert hands, and represented the familial badges of those lords whom the prisoners may have owed allegiance to. Above. Christ on the cross, with Mary Magdalene and the Virgin Mary at his sides. Above. Two warriors fighting with clubs. Above. One of the carved panels to the left of the door. Above. St George trampling and slaying a dragon. Above. The highly decorated right side of the wall. Above. A boar...the personal motif of a young Yorkist Captain, Richard of Gloucester, soon to become Richard III. Above. A crowned lion can be seen, Lord Greystoke's motif. The depth and range of the carvings is amazing, and the fact that they have survived some 530 years is even more startling. Modern thought tends to lean towards these carvings being created by guards rather than prisoners. Unfortunately, the glass door makes photographing them very difficult. 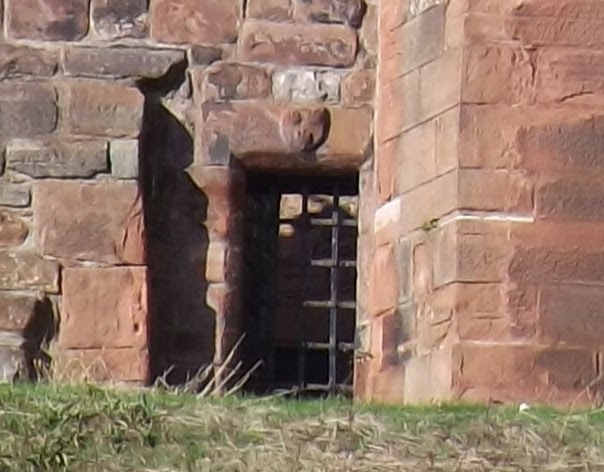 The Dacre Postern is to be found at the North West corner of the inner ward at Carlisle Castle, and also sits amongst the ruins of Queen Mary's Tower. It consists of a few remnants of what would have been a heavily defended entry\exit point to the city (within the walls) The postern also incorporates the remains of the early\original Norman entrance into the castle. Above. The postern and the single remaining portion of the Norman gate. The photo above, shows the Dacre postern, now blocked up, with the last remains of the original Norman gate. The gate was blocked when the outer gatehouse and the Captain's Tower were built in the 1160s. All that remains now, is one single jamb of the gate, with its port cullis groove and some holes where a door or a gate would have been leaded into. Above. A close up of the remaining jamb of the original gatehouse. In the photo above, the Dacre postern can be seen disappearing to the right of the gate jamb. The postern would have been a heavily defended minor entry\exit point from the inner ward, and would have provided additional access to the Eastern walls of Carlisle. Above. Another view of the Dacre postern from within the remains of Queen Mary's tower. Above. The Dacre poster from outside the castle. The photo above, shows the Dacre postern from outside the castle walls. The new stone work (lighter colour) represents building and repairs dating from 1834 to 1835, when the dilapidated Queen Mary Tower was demolished and the resulting damage made good. Luckily for us, the Dacre postern was retained. Above. Close up of the external face of the Dacre postern, showing the Dacre coat of arms. Above. The Citadel showing Botchergate looking North. Above. Canon outside the Eastern Tower. Above. Canon outside the Western Tower. Above. Looking towards the Eastern Tower. Above. Statue of William Earl of Lonsdale outside the Eastern Tower.